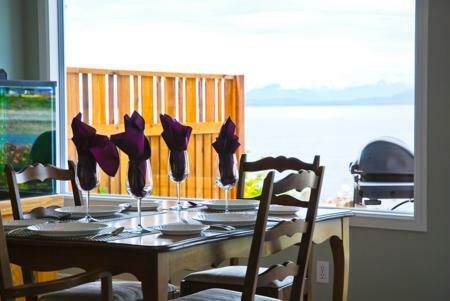 Come enjoy the very best the Comox Valley on Vancouver Island has to offer at the Abode at the Beach Retreat. 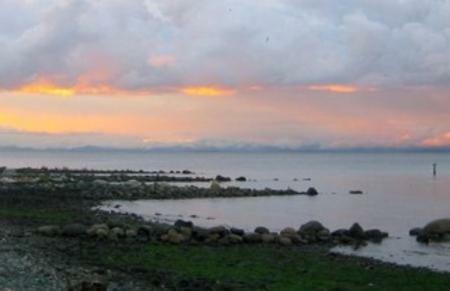 Abode at the Beach Retreat is situated in a sheltered cove at the mouth of the Little River overlooking the Salish Sea and the Coastal Mountain range directly on the cruise ship route to Alaska. 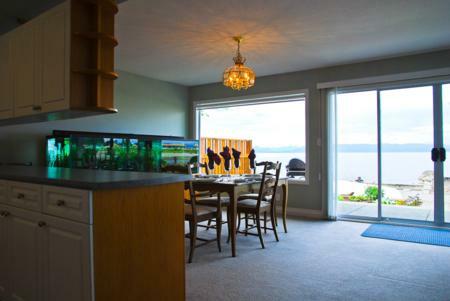 This oceanfront vacation home is approximately 1400 square feet featuring a large fully equipped kitchen, 2 bedrooms and a den, 1 bathroom and an outdoor hot tub overlooking the ocean. 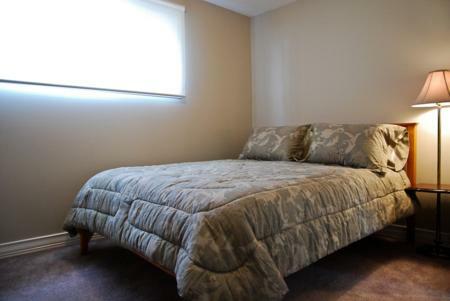 The spacious master bedroom has a king size bed, the second bedroom comes with a queen size bed, and the den contains a queen size futon for extra sleeping room. 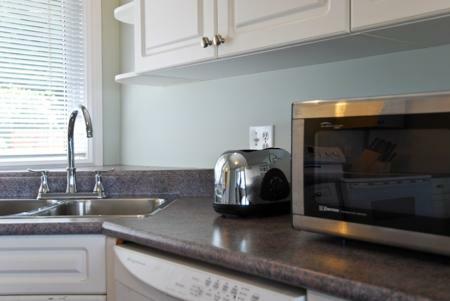 The amenities of home include a washer and dryer, cable TV, and wireless internet. 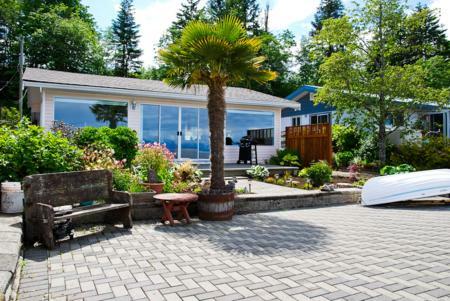 The Abode at the Beach has a large outdoor patio area complete with a fire pit, barbeque grill, and center piece palm tree to provide some shade during a warm summer day. 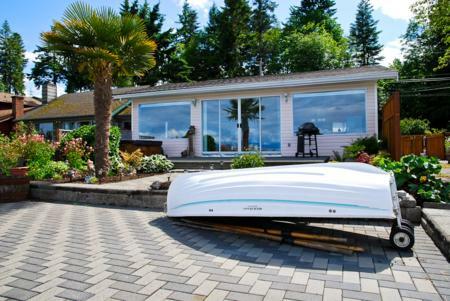 As well, there is a private boat ramp that is perfect for launching kayaks or the supplied rowboat. 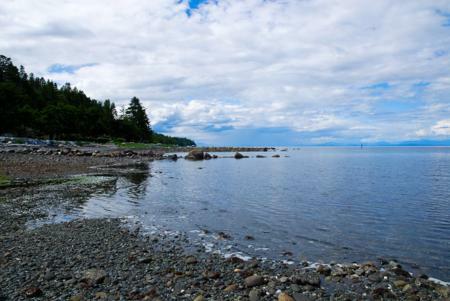 The waterfront location in Little River Cove gives you a wide variety of views as the tides can put the water right at the doorstep at high tide or can empty the whole cove out at low tide providing the perfect opportunity for beachcombing and exploring miles of beaches. 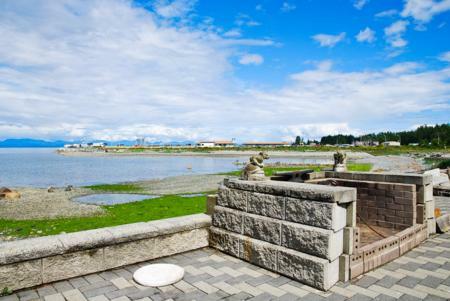 Ideally located, the Abode at the Beach Retreat is only 10 minutes drive from the city centers of Courtenay and Comox. 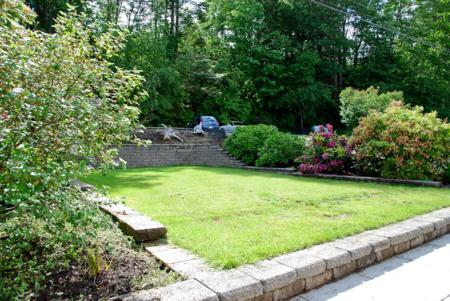 10 Minutes from the Comox Valley Airport. 2 Minutes from the Powell River Ferry to the Sunshine Coast. 45 Minutes from the Mt. 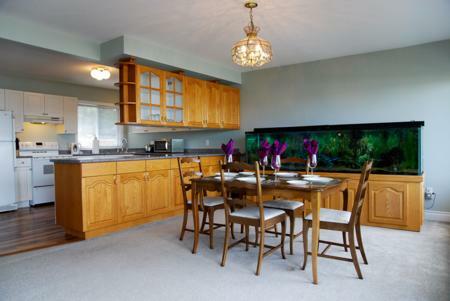 Washington Ski Resort and within a short drive to several Golf Courses in the area. 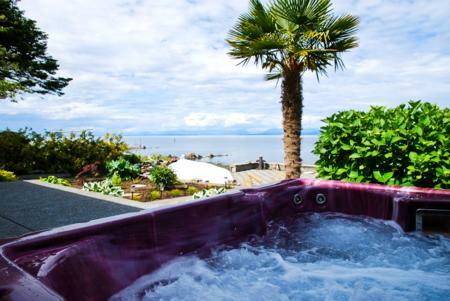 Experience Vancouver Island oceanfront living at its finest. Our vacation was excellent and we're happy with the bookings servioce these was excellent. Thanks again and if we come back to your beautifull country we will take up again your company. The house was very tidy and clean. Only the BBQ grill was very dirty and caught everything on fire as it was needing a good cleaning. So we used the stove to cook. 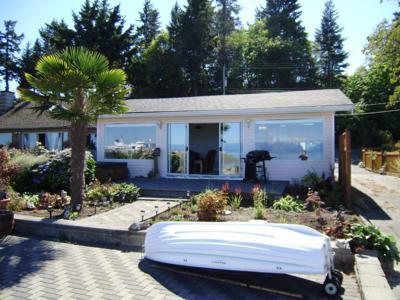 I would like to mention that if we had know this house was so close to the ferry terminal we would not of booked it. I noticed that after arriving, it looked like the photo that was in the advertisment, did not have the busyness of the termal. Because in the photo at the same angle there is no way we could not see the terminal. Was it photo shopped out? The beach is advertised as a pebble beach, it is more a barnacle encrusted rock beach with oil floating and debris floating from the terminal. We drove to nicer beaches. Please note it cannot be advertised as free internet. My husband was on the phone for half a day trying to hook up the internet. We had to buy a cable to get better internet service. In the end he could not access his emails from his office as the service was intermitant. Suggestion a fan provided. We bought a fan as well. It was very warm and when we left the windows open to get a breeze the neighbour had someone arrive at 530 am parked right beside the bedroom window and leave the car running. 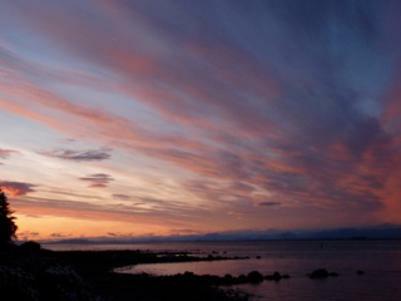 Over all it was a very nice area of Comox. The neighbours were very nice. In the future I will ask more questions about the accomodation. We will not go back to this property. Thank for your testimonial on your stay at the Abode at the Beach Retreat. We are glad you enjoyed your overall stay at the property. We would like to address some of the concerns you raised. We will look into why the BBQ grill was not cleaned by our cleaning staff. However, we need to be notified immediately of any cleaning issues so we can send someone out to rectify them. The images are not photo shopped and are exactly as shown. 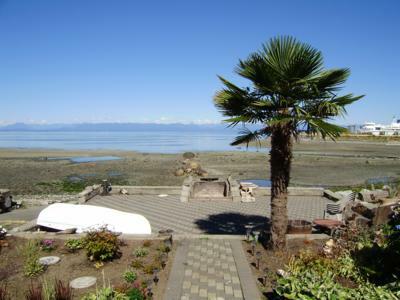 If you look at the lead image you can see the ferry terminal to the left of the property view of the ocean past the palm tree. 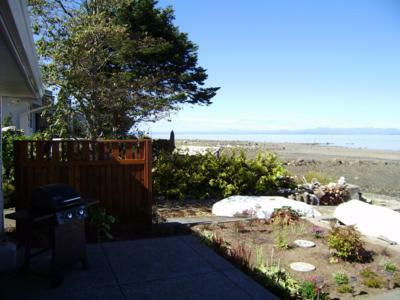 Also there are many other images in the gallery showing the ferry terminal to the left of the ocean view from the house. The ferry terminal is for access from Vancouver Island to Powell River on the Sunshine Coast. Not a very busy terminal unless with a possible couple extra sailings during a holiday weekend. The beach ise pebbled and rocky. Barnacles do make their home on many of the rocks and beaches around Vancouver Island. Yes, there is free WiFi internet in the house. We are unsure why your husband had difficulty connecting to the network. It could be that the service provider may have been experiencing technical difficulties during your stay. Please call us when issues arise, so that our staff can look after them to ensure speedy resolution. If we don't know, we can't help you. Very warm days on the Pacific Coast of British Columbia are not common, with typically a few days per year getting very warm. 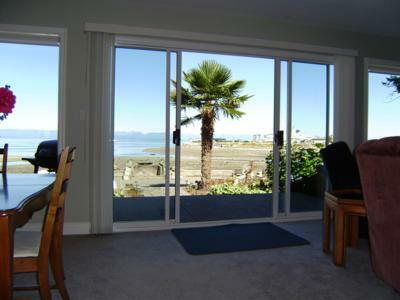 Air conditioning units or fans are normally not needed with usual cool breezes coming off the ocean. 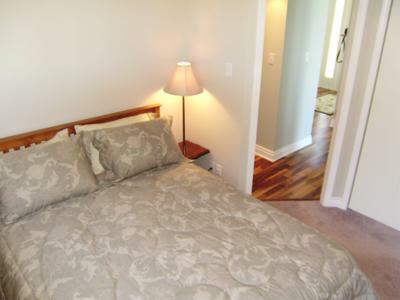 However, most of our properties do have fans available. We will look to ensure a fan is provided in the property for the future. As for the neighbour having someone running their vehicle at 5:30 am outside your bedroom window, this was not polite of them but it looks like you were able to connect with them and thought they were nice. We are positive that this is not a regular occurrence. We are sorry to hear that the property did not meet your expectations. You are correct to say to ask as many questions about a property before booking it. Our agents try their best to ask as many questions as possible to ensure they are helping you find the perfect property for your stay. Next time, we are sure the perfect property will be found for you. We hope to see you again in the future. It was great accommodations with wonderful views of the cruise ships at night and the beach with the tides was awesome and we enjoyed the boat. We were very pleased with the vacation rental. I would recommend it to my friends. Wifi internet connection was very poor, had a hard time to use as service would come and go. Had a great time. Planes are a bit loud. 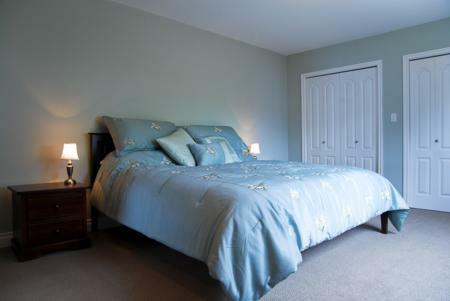 Beautiful Spot, all the comforts of home, very nicely appointed. We would have appreciated a selection of movies, some board games and a bird book. The tow planes were super annoying, but overall that is a small thing. Also, would have liked a slightly larger BBQ. Again, the above is for your reference and are not major complaints. Overall we loved the Abode at the Beach and would definitely come back. Good place to stay along the ocean even though the winds were some of the strongest in this winter. BBQ was rusty and needs a new grill. The aquarium was unbelievable and provided hours of entertainment for my son. This is a lovely little beach house. Great location. We encountered three problems. First and most important there was a terrible smell in the bathroom. Obviously they are having problems with their septic system. We alerted EMR and they attired to contact the owners. I guess they do not have the authority to just fix the problem. No one came and while over days of perhaps water flowing the stench was better enough that we could breathe through our noses! And, no apology even came from the owners, no adjustment. We were there for a family funeral and the family gathering following the service took place there amidst my embarrassed apologies. These things happen and all homes have problems now and then. But I was very unhappy at the lack of immediate response as a clean bath that is inhabitable is important. 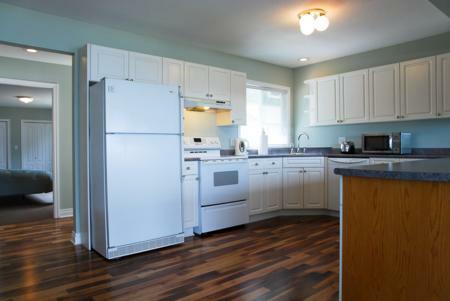 Secondly, the kitchen is poorly equipped. We bought pots and pans and frying pans so it is better now. 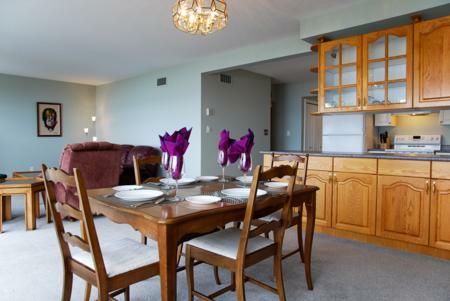 We love vacation homes and the reservation service with EMR is good, the greeters are good. The negatives are that EMR needs to have the authority to remedy problems and my other objection is the automatic and high cleaning fee. I leave the homes in excellent and clean condition 250 is a pretty steep price to pay for a quick vacuum, changing one bed and wiping down a fridge. It would be more appropriate to charge an hourly rate. 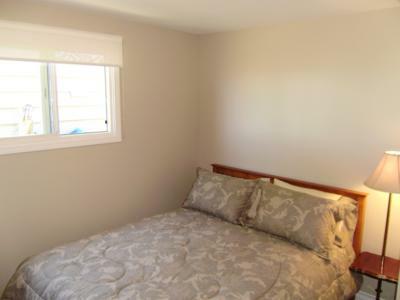 Some of us so care for a vacation home the same as we do our own and I cleaned windows, washed floors, vacuumed, left the bath spotless, swept the steps and walk, washed put drawers changes the second bed etc. So I object to paying for what I have already done. It's the system but I think it is sometimes just not right. 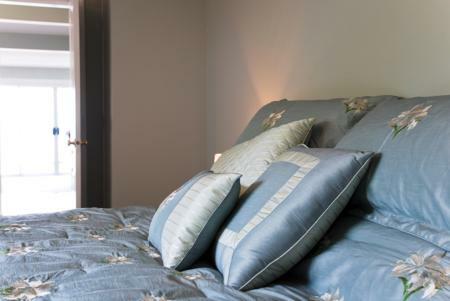 Do stay at the Abode but do make sure the odor problem is fixed and have your own discussions about cleaning fee. If the bath issue gets fixed, this is a great spot for kids. 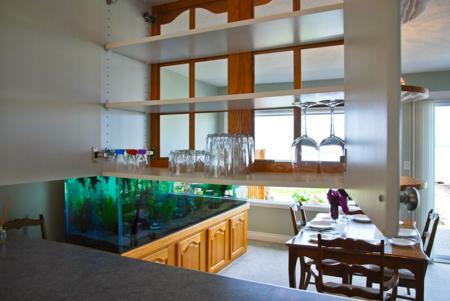 Nice access to the beach, comfortable beds, nice aquarium, etc. 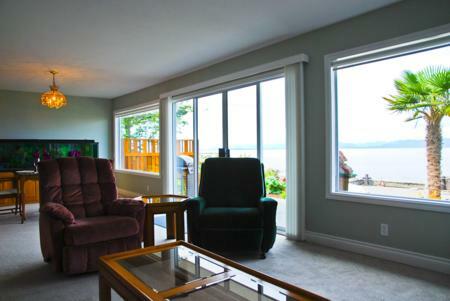 Thank you very much for providing us your experience while staying at the Abode at the Beach Retreat in the Comox Valley. Sounds like you a had a nice with the exception of the septic issues you mention. We have looked into the matter and found out that EMR did connect with the owner on the day the complaint was made about the septic smell and a plumber was called to come out the next day. When we called to say when the plumber was coming the guest told our cleaning coordinator to not send out the plumber since the smell had dissipated overnight (not days). After discussions with the guest it was found out bleach had been used and the house policies are very clear not to use bleach when washing otherwise the ammonia gases end up coming back up the pipes. Future guests take note please do not use bleach when using the washing machines or pouring it down any of the drains while renting this property. Our professional cleaning staff provide a lot more than just a quick change of bed linens, a vacuum, and a wipe down of the fridge. 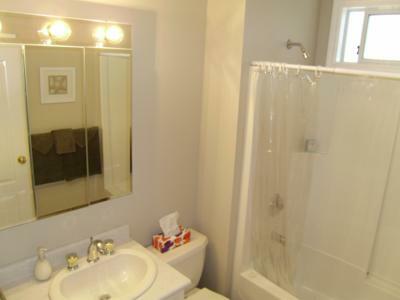 It is thorough deep clean throughout the entire house. Secondly, the clean rate is not $250 it is $150.00. The cleaning fee ensures that the next guest will come into the property knowing full well the property is spotless for their stay. We are very happy to know you enjoyed the house and the beach. We look forward to your return in the future. Really enjoyed the views, lots of space even though we thought the home might have been on the smaller scale. Hot tub was great. A very small recommendation for a family like ours would be to add a few more place settings in terms of plates, bowls, etc. Thanks for the wonderful week. The accommodation was fine. It was too close to the neighbors, however when out on the patio, that was not an issue. It was great for my mother who is 83 and has difficulty getting around. We enjoyed the beach, and the resident eagles, herons, and a deer. Watching the cruise ships and barges going back and forth, she even enjoyed the ferry traffic including the 630 am horn. Overall it served our needs very nicely. 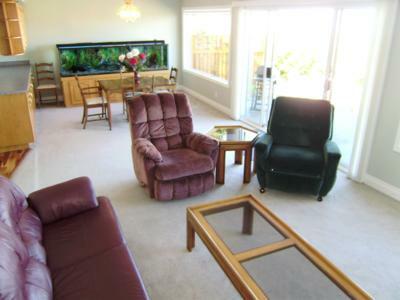 The House is in a wonderful quiet location and the direct access to the sea front is a real bonus. We found the accommodation spacious and well furnished. 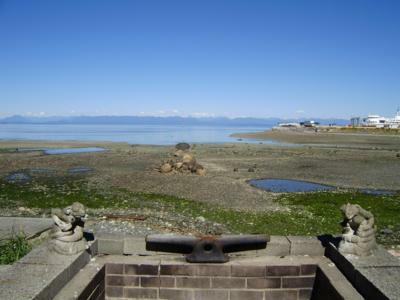 We were fortunate in having some very good weather and the views to the mountains on the mainland are exceptional. We had to drag ourselves away to go out anywhere. 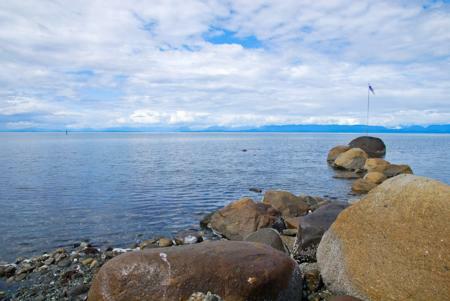 Comox and the surrounding area are terrific with good shopping just a few kilometres away and the beautiful Comox Lake just a short drive. 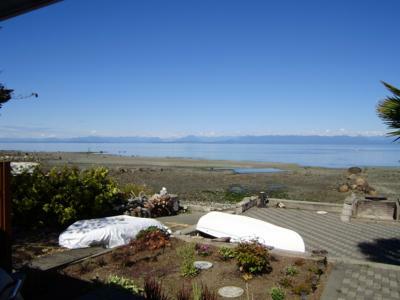 The house is perfect and central to explore Vancouver Island. I would recommend this property to anyone. 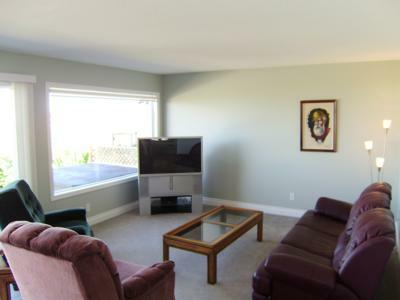 A very comfortable and clean home with all the amenities and fantastic views. It was hard to leave and I know we will return.